I've been wanting Konad for a while and when I walked through Colchester to uni I came across Nail Delights, a shop dedicated to having the most beautiful nails. You can follow them on Facebook, or shop online at their Nail Delights store where they ship worldwide. Also, if you shop between now and 30th of April, enter 5OFF30 at the checkout and you can grab £5 off £30. Also, free delivery within in the UK if you spend £10 or more - Which is easily done! - or worldwide when you spend £15. 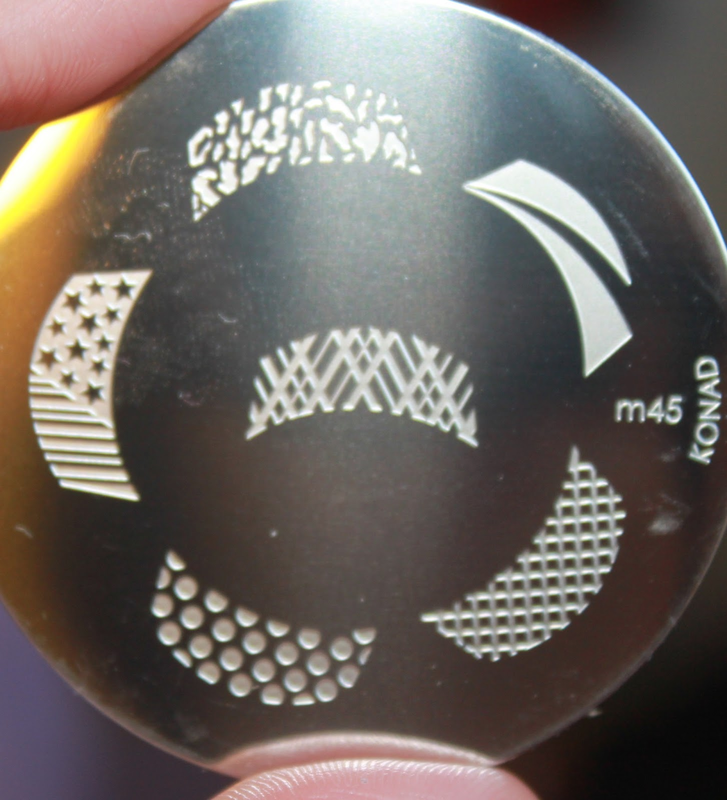 They also have a Daily Deal where I picked up a Konad plate from £6 to £3 - Bargain! The staff are so nice in store and are willing to help and are always friendly. 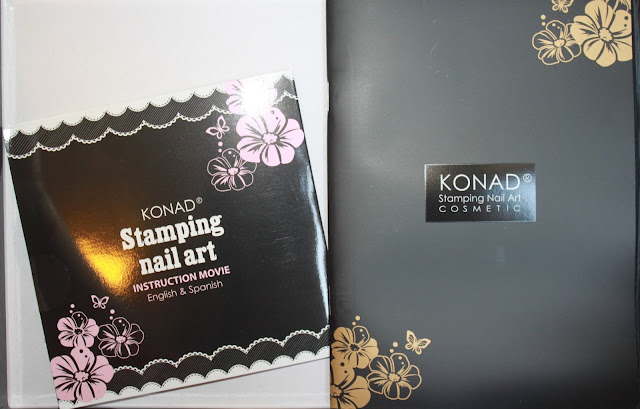 The Konad kit contains 7 Image Plates, 2 Scrappers, 1 Double Ended Stamper with two sizes, a Image Plate Holder, 5 Princess Special Nail Polish and 1 Top Coat. It also comes with a mini Konad catalog and a Konad DVD showing you how to achieve amazing nail designs. 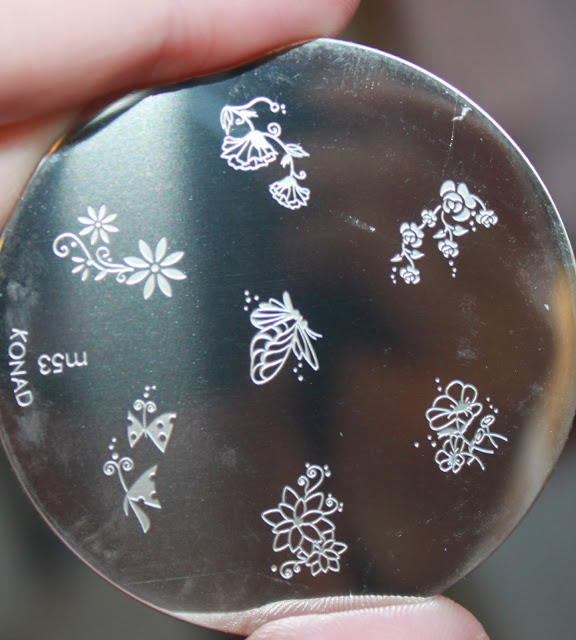 The box it comes with is gorgeous, engraved with the Konad signature and embossed flowers around the sides. Inside, everything is laid out beautifully in a purple silk, perfect for a princess. This collection RRP's for £70 with around £90 worth of bits, but Nail Designs do it for a generous £40 at the moment. Below are some images of the kit, some nail designs I did, and a step by step on how to use this kit. On the side of the box. L-R, Princess Polishes in Cool Red, Yellow and Deep Jungle. L-R, Princess Polishes in White, Top Coat and Gold Black. Stamper, Image Plate Holder and 2 Scrapers. 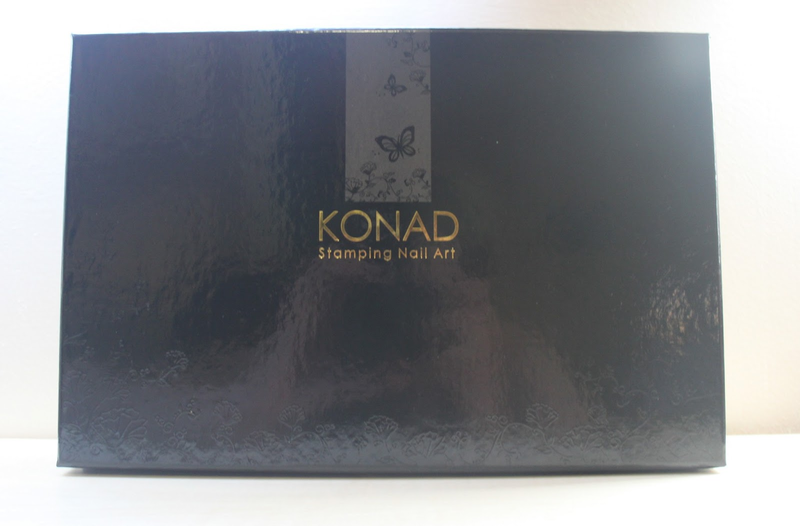 Making amazing nails is so easy with Konad. The possibilities are endless and there's an Image Plate for everyone! 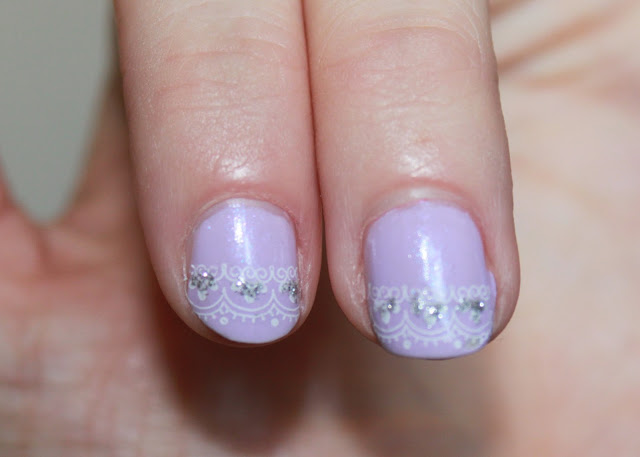 If you're not very good with the nail art brushes or pens, then this is so easy and anyone can create beautiful nails. So how do you do it? 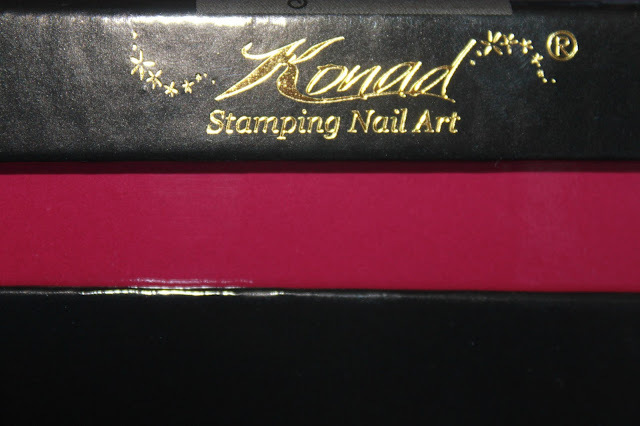 Grab a Konad polish of your choice. Some polishes by other brands may work, but Konad polishes are thick and pigmented making them perfect for this. 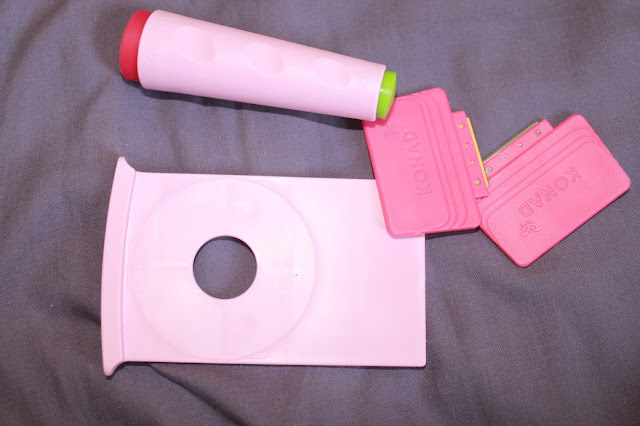 Also, the Princess polishes don't dry as normal polishes so avoid using them as a standard polish. With the polish, apply it to the design of your choice. Now this is the part you have to be quick. 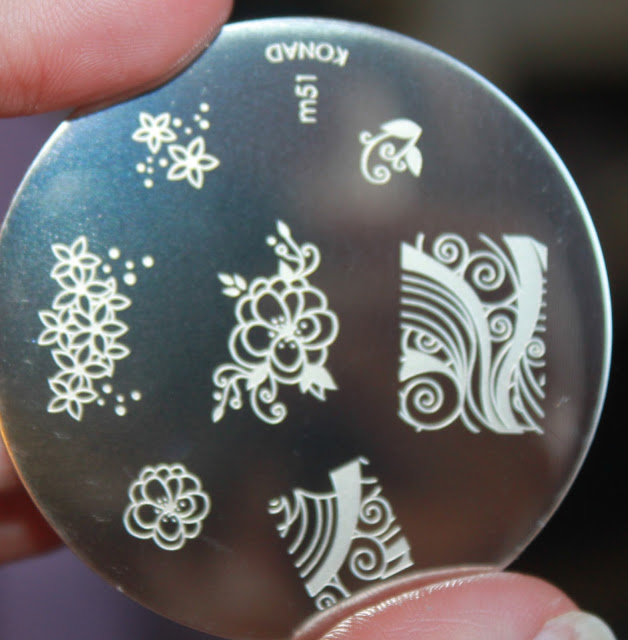 Quickly scrap off the polish with the scraper until you can see the design. 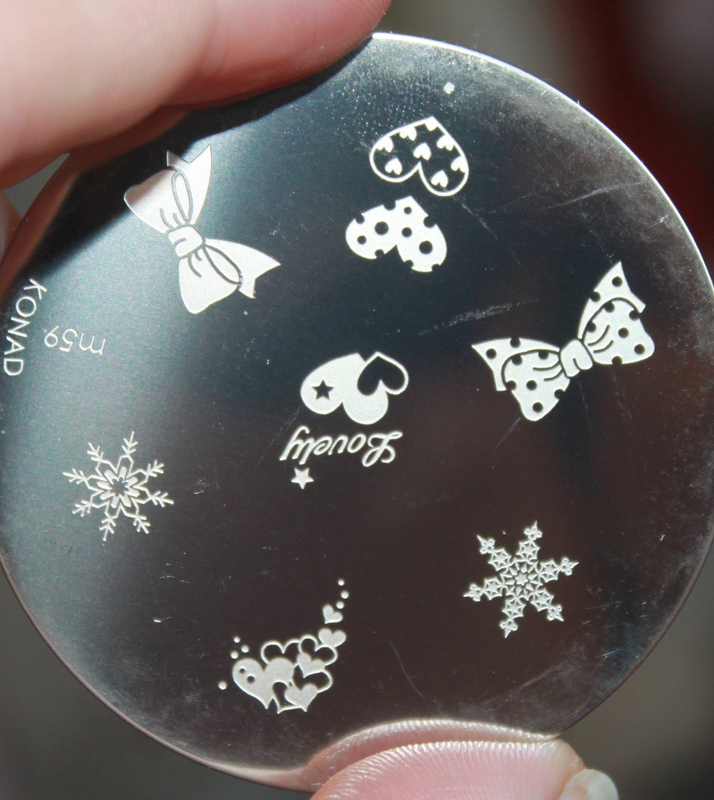 Fast, roll the stamper over the design, picking it up onto the stamper. 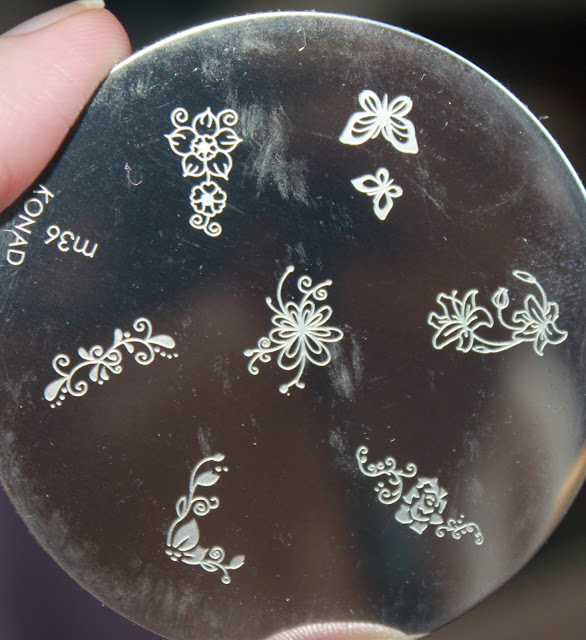 Be careful not to just stamp the stamper down and to roll if over instead. 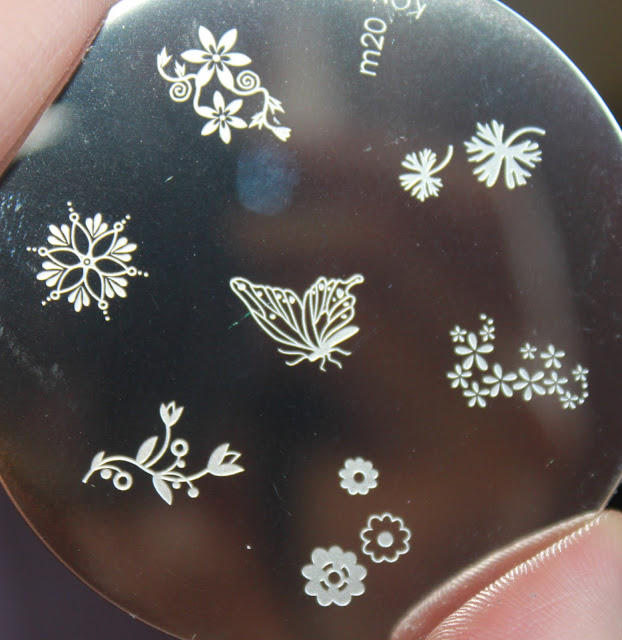 With the same rolling motion, apply the stamper over the nail until the design is on the nail in the desired way. It's that simple! Cleaning your plate and scrapper is easy too, with a ear bud dipped in polish remover sweep over the plate until it's clean. As I said, the possibilities are endless, and below are the nail designs I was wearing this week. 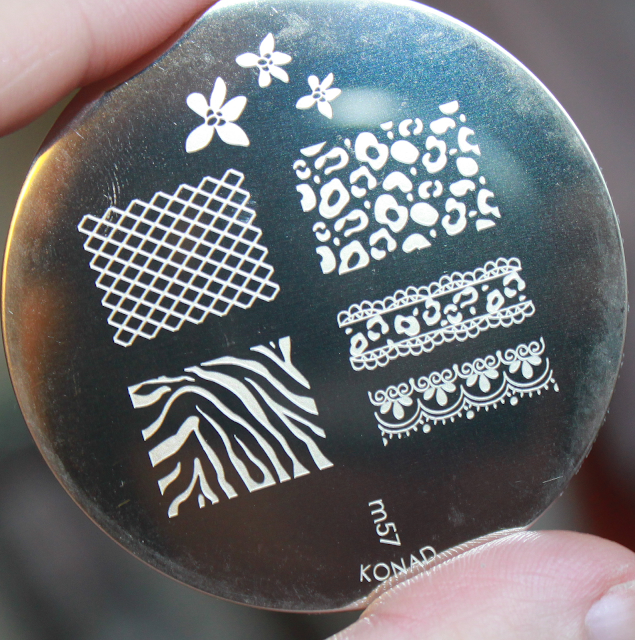 The Zebra print is the first one I ever did, and as you can see it's slightly rough, but still looks good. Another point is the top coat. A top coat is ideal for lasting wear of your Konad prints. With the zebra print look I used a standard clear polish which as you can see, dragged the design. The top coat that came with the Konad kit which I used on the last design of the red flowers and blue and white gradient works really well with the designs. The only tip I can give is to apply the top coat as quickly and as softly as possible. So there we have it! My Konad kit is my new love for easy nail designs and is so quick to do as well. Let me know what plate and design you like most! Thanks for reading, beautiful! I used the Cool Red polish for the zebra print using Image Plate M57. Using the White Konad polish I used the Image Plate M57 to create the lace effect and applied my own glitter polish. With my gradient nails, check out my tutorial for this here, I used Cool Red again and M57 Image Plate. Oh wow I love the last ones - amazing! This looks fantastic, you make it all look so easy! Wow, love the looks you created! Your ombre floral nail is the prettiest!